Cody asking Rick for a way to get her out of the exams and him handing her an envelope… with the exam papers in it. Debbie confessing that she was with Julie when she died. Cody is mentally debating what to do with the exam papers when she is distracted by a noise outside and goes to see what it is – it's the Kennedy family moving in. 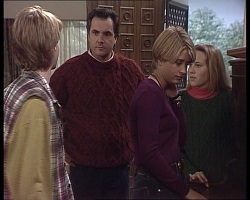 The Kennedy clan – Susan, Mal, Libby and Billy – begrudgingly begin moving their belongings into their new house while Karl supervises the removers. The kids are a bit sceptical about their dad buying the house without telling them in advance but Susan puts on a brave front to back her husband up. Back with Cody and she decides to throw the envelope with the exam papers into a drawer. 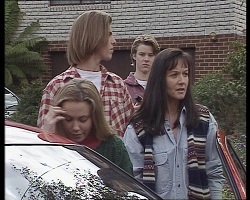 Brett and Hannah spot their new neighbours moving in and his is immediately taken with how good looking Libby is. Danni is waiting for her brother as he enters wanting to know how the scattering of Julie's ashes went and he replies it was weird and that nobody spoke on the way home. Danni goes to sticky-beak out the window as the Kennedy's are moving in, describing the family composition to Brett as well as letting him know her thoughts on Karl – he's an evil doctor! Brett fills in the names of some of them (thanks to Hannah) while Danni continues her insults, describing the family as feral and describes the oldest (Mal) as being as up himself as his father! She really hates the family and they've barely moved in although she is taken by Mal's looks. Brett tries to stick up for the new family but Danni's mind is already made up. DANNI: It looks like a family of nerds has just moved into our street. Cody lets rip into Rick for giving her the exam papers and reminds him that she isn't a cheat. He pleads that he thought it would help but refuses to say who gave them to him when she enquires. Surprisingly two visitors arrive at the Kennedy house to welcome their neighbours – Danni and Brett! 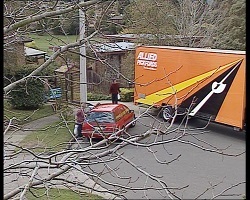 Susan tries to get rid of them as they've still unpacking but the duo are round to volunteer their services. The kids introduce themselves and Danni can't resist having a dig at Libby about her clothes which Lib isn't impressed with. Karl is surprised to see the Stark siblings round but they assure him they are round to help however when Brett helps Libby to move the piano, a chair ends up getting pushed into the wall creating a hole and Susan has to place an arm on Karl to stop him going off on one. KARL: I think its time you two went home don't you?! Debbie didn't know why Julie was up there so she followed her there and found that she was holding (and drinking) a glass of something, wine possibly. From the flashback we can see a clearly upset Julie standing there trying to tell Debbie how she feels/felt. Julie told Debbie that it was all her fault and that she can't seem to help it but despite Debbie trying to calm her down she got worse. 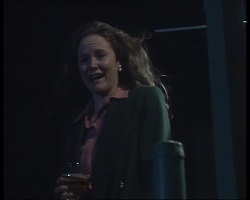 Tearfully, Debbie tells them that Julie was standing very close to the railing, which wasn't very high, and we head back to flashback land and Julie telling an upset Debbie that they'd all be better off without her. We then see Julie throwing the glass away and her literally following it as she too tumbles off the tower having fallen over the edge. Debbie continues to tell them it was like watching it all in slow-motion and that Julie didn't make a sound, she just fell. A now distraught Debbie adds that she didn't even get the chance to tell Julie that she loved her and as the camera pans out we see that Phil has begun crying too. Libby is having a go at Karl for the speed that they moved house and not getting the chance to say goodbye to all her old friends but Karl explains that he'd just had enough of everyone knowing his very move and wanting to consult him 24/7 over every little symptom. Susan reminds him that is called living in a community and adds that she isn't going to change just because she has moved. The kids begin to bicker amongst themselves so Susan lays down the law – they are here now and its going to get okay! Cody and Michael talk about Debbie's revelations as they wait for their drinks. Danni briefly enters TCS but after a tense chat with Michael quickly leaves. Cody picks up on it when they sit down but Michael tries to avoid talking about it and moves things on to talk about how she is. After skirting around for a bit, Cody eventually tells him about her “present” – the exam papers and that she doesn't know what to do about it. Michael's advice is to cheat so she can get the necessary marks to get into medical school. Phil decides against Helen's offer of a tea in favour of a whisky and she asks for his approval to take Debbie to the psychiatrist she previously saw. He agrees and after Helen's suggestion that he should talk to someone replies that perhaps she should too. Helen does point out one thing to come out of Debbie's revelations - that he can't be held accountable for Julie's death anymore but he doesn't seem cared by this as he finishes his whisky. Brett reads a letter he has received from Lata trying to ignore what his sister is saying to him about her but to her surprise, confirms that she now has a boyfriend. He doesn't seem too bothered though and Danni starts interrogating him to find out who the mystery lady is but he is keeping quiet. Debbie and Helen are back from seeing the psychiatrist and things seem to have gone well, which Helen re-affirms once Debbie heads to her room to lie down. Helen also mentions that the psychiatrist agrees that the New York trip would be good for her if she had someone to travel with and Helen has volunteered herself. Phil still looks so down and Helen brings up that the inquest into Julie's death still has to progress despite what Debbie has told them but knowing that she didn't commit suicide is a weight off their mind. PHIL: Knowing how and why it happened doesn't bring her back Helen. She's still gone. Rick takes the opportunity to talk to Cody about his hotel management training he is hoping to organise with Rosemary as he plays footy with Cody and Brett although it is Brett who is doing more of the running! While he is off running to get the ball Rick has just kicked, he brings up the exam papers with Cody and she asks that the papers remain with her; she hasn't decided what to do about them yet! Before she heads to the shops with Helen, Debbie invites Phil to come to the US with them (taking Hannah too) but he turns it down as he feels closer to Julie staying at home. She then offers to stay at home but he insists that she goes as long as she sends lots of postcards and turns down their initiation to go shopping with them, preferring to cry alone. Billy and Libby escape from organising their rooms to join in the footy kick around with Cody, Rick and Brett after the introductions. Brett and Libby seem to forgot about the game though, content enough with gazing into each others eyes and just as he plucks up the courage to ask her out, the others return and Susan comes out to haul Libby and Billy back inside. Reluctantly they walk inside with Brett watching her every move. Hannah rejects Helen's invite of a trip to New York because she wants to help her dad. 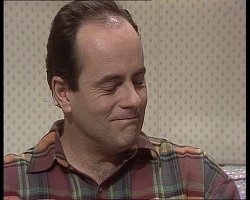 Phil listens in from the livingroom and smiles to himself as he hears Hannah tell Helen that she and him need to stick together. BRETT: Watch you Libby; I'm going to make you mine.